Wake Treasures is the award-winning quarterly journal of WCGS. Wake Treasures regularly publishes primary source documents with historical or genealogical significance for Wake County, North Carolina. It will also publish primary source documents from related counties if there is no genealogical or historical society serving that county. The Journal welcomes articles about methodology and research experience as well as articles portraying Wake County residents, places, and events of the past. It seeks a balance of time periods and hopes to address the needs of both new and experienced genealogists. These are examples of Wake County material which has been abstracted/transcribed and published in the journal. - Deed Book R ... and much more! Visit our Spotlight page for a "peek" into the journal. - General Assembly Record Petitions. - Registry of Licenses to Trade. In addition to these, Wake County Genealogical Society is working on transcribing or abstracting many other exciting record sets and publishing them in our journal. To learn about projects which are underway, visit our Projects page. 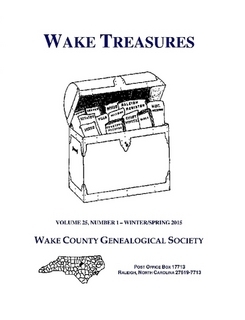 Members of WCGS have access to download all issues of the journal on the Wake Treasures page of the Member’s Area of the website. If you would like to become a member of WCGS, click Joining WCGS to find an application form or to join through Paypal. Nonmembers may also purchase past and current issues of the journal through the WCGS Lulu Store. A Subject Index to Wake Treasures is available for free. This index includes information for all volumes 1-25. Wake Treasures is seeking additional volunteers to help with transcription and abstraction of these invaluable records in order to make them available to genealogists and family historians. To learn more about volunteering, click here. If you are hesitant, click here! To download our easy list of instructions, click "rules". If you are ready to start, send an e-mail to our Journal Editor to express your interest and THANK YOU!